Excerpt from KNOWING WHEN TO STOP: A MEMOIR by Ned Rorem (pp. 234-5). Copyright © 1994 by Ned Rorem. Reprinted by permission of Georges Borchardt, Inc., on behalf of the author. 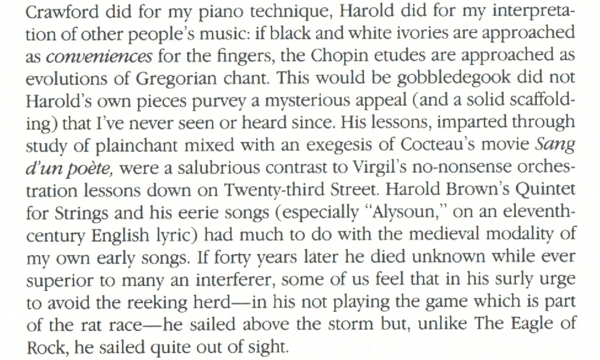 It would have been in 1942 that my friend, the pianist Eugene Istomin, introduced me to Harold Brown. Harold was the first real composer I ever knew, despite my time at Curtis. His music was modal, vocally inclined and quite contagious. If only it could have survived more vigorously!